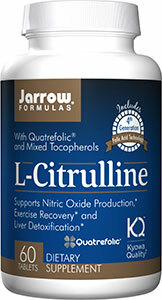 The amino acid L-Citrulline is a substrate in the cycle that includes L-arginine and L-ornithine. L-Citrulline supports nitric oxide production, which is important for blood pressure regulation, immune function, healing, as well as helping the liver detoxify ammonia. Quatrefolic® (Methyl Folate) is the 4th generation of Methyl Folate is needed to support cardiovascular and neurological health as well as proper cell division. Folate and gamma tocopherol work with L-Citrulline to support the production of nitric oxide. Other Ingredients: Cellulose, stearic acid (vegetable source), silicon dioxde and magnesium stearate (vegetable source). 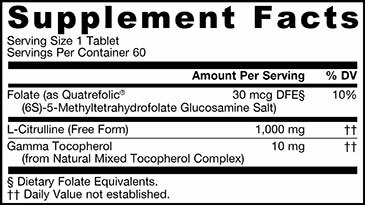 Usage: Take 1 tablet per day with food or as directed by your qualified healthcare professional.